Somehow, the older I be, the busier I do. Work on friend’s 1900CSS consumed my time til just recently, I don’t mind; I got to have a 1900 around (and a 1900 Super came in after for two months’ work). My Tiger has been sitting while other projects take its place. I keep finding other things to do! I bought one each of one-owner 74 Spider and 73 VW Bus. But once the VW Bus is out of the garage I’ll get back on the Tiger. I built up a 79 Spider to go to a friend in Georgia, I left off the smog whatnots (no smog test in GA) and had a nice simple car. Last year I bought an 89 Mustang 5.0 five-speed to satisfy my urge/need to drive a small-block Ford til the Tiger’s done. Well, you see, then this 69 Berlina and this 67 GTV came along? So I sold all three Spiders and the Mustang and bought it (see below) and, to complicate things further, an original California GTV. Busy times but good ones. [Learned of this car from Ian Jephcott; thanks for putting us in touch] A little about the Berlina: 1968 1750 UK car, which has been competing in varying forms since the late 70’s; it was re-shelled with a Cypriot shell in the late 80’s. It was raced in road going circuit spec by Chris Taylor and Ed McDonough at an early stage of its life (see second pic below). It then went to The Isle of Man and was used in the Manx Classic hillclimb for a number of years by David Turner (in those days it was red). I purchased in 2015 and have used it in hillclimb and sprint events in the UK since. It currently competes in the MAC Sunrise Sprint Championship, the HSA Speed Championship, and the Midland Speed Championship. 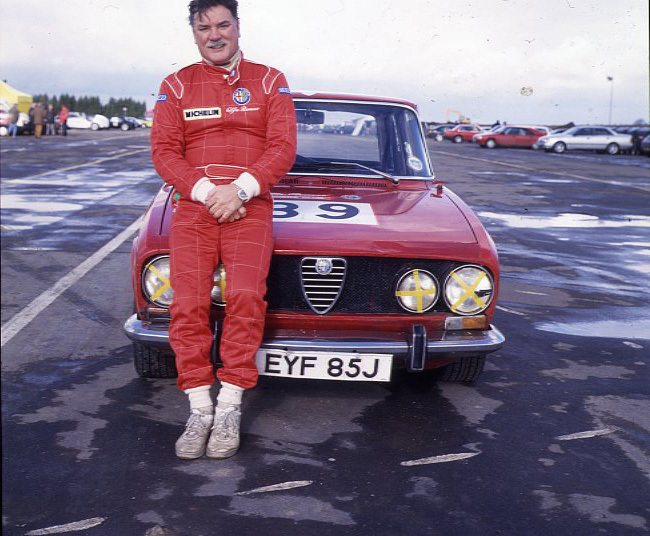 When acquired it was in a light hillclimb competition spec (see current-condition pic above) with a 2000 rear axle, Alfaholics suspension and exhaust manifold its was turning out 110bhp but we have since carried out the following: uprated engine using Classic Alfa high compression original pistons and race cams (secondhand, spec and make unknown). The head and inlet manifold have been ported and Dell‘Orto 45’s added by Dave at Mech Motorsport in Cheltenham. Window glass removed and replaced with Lexan, new Cobra driver’s seat and up-to-date harnesses and a OHP full cage, fuel tank removed and light weight race tank fitted, and an Alfaholics exhaust. Alfaholics 8 x 15” wheels added with Kuhmo 225/50-15 soft tyres and set of 1969 Homologation GTA wheel arch extensions also from Alfaholics. Recent new Classic Alfa gearbox fitted. 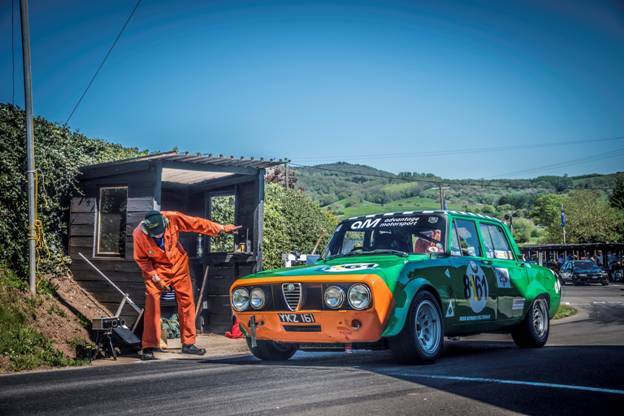 The work has been carried out over the last three years by Brian Cornock of Mech Repairs in Cheltenham and Dave Young of Mek Motorsport Rolling Road in Cheltenham. The car has been engineered bit by bit as we’ve gone along adding and tweaking along the way. It current puts out 168bhp at the fly wheel and is extremely drivable and quite competitive. Sooooooo, kind of out of the blue, I got offered a really nice Berlina in February. And guess what, I bought it. It’s a white/red Canadian-market car, sold new in Quebec, migrated west across Canada to BC. 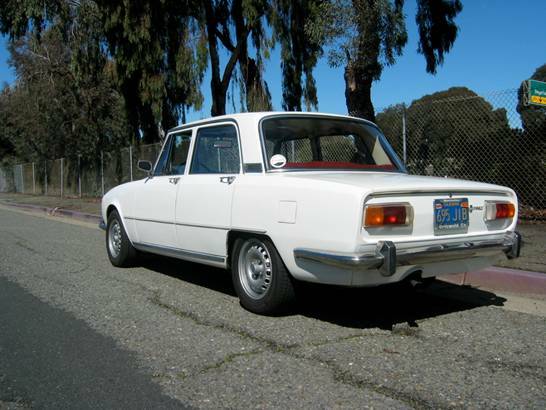 Then down to California in the early 70s, owned first by a mechanic at the famed Griswold dealership in Berkeley (he’s still at it, building engines for Patrick Ottis Ferrari), then in 1978 he sold it to a local guy who used it for fun, not a lot of miles, because he was busy racing the Giulia TZ he had bought in 1970. More recently, he was clearing his garage for another acquisition, and I happened to be in the right place at the right time. 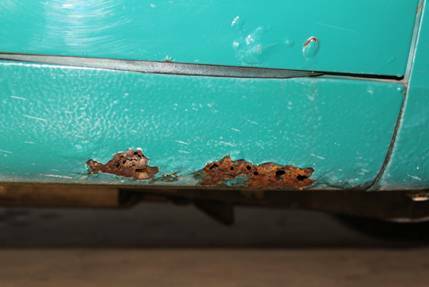 Car has had some minor rust repair and repaint over the years, but let’s call it organically original, not restored. Driver’s seat is recovered, rest of interior is largely original. It has its original motor, rebuilt with Euro cams, big valves, 45 Webers, a GTA exhaust, other mods. Driveline, suspension (has TI Super springs), and brakes have all been kept up to snuff. Lots of records with the car, I can see what’s been done over the years. Anything needed doing got done. Then, I fell into a set of real magnesium 14” GTA wheels, which seemed just the thing for this car. On they went. Car is stunning to look at and great to drive. All the white US-market Berlinas I know of had black interior; this is the only red one I’ve seen; everyone remarks on the combo. So happy. I rotate between my Super, Berlina, and Stepnose GTV. I can’t keep them all forever, but for now I’m making the most of it.